There are three types of workers. What are you? 1. There are those who wont do anything and they just get fired ultimately. Although in some careers it can take longer than it should! 2. Some people will do the bare minimum to avoid getting fired. Anyone remember that? I hope nobody here is like that. 3. Finally is what I call the ‘above and beyond’ workers. Above and beyond the call of duty workers. It’s said of Joseph that his master didn’t have to worry about anything while Joseph was there, because Joseph took care of it. I would ask you this: Are you a shirker, or a worker? Do you put in the hours, and more importantly do you put in the effort that is required? Act 2 of Esther makes this point: Esther, we have already seen is working hard, beginning to do everything that needed to be done. But now we see her involvement in the king’s life being spared. Mordecai uncovers conspiracy, he tells Esther and Esther informs the king. Now that wasn’t part of her job description, or Mordecai’s to be part of the king’s security detail. Have you ever worked with people like that? ‘Oh I can’t do that, it’s not on my job description’. But here God’s people thought they could do something, they could make a difference, so they decided ‘well, why not? Why would we not do that?’ For us it might mean thinking the best, serving in the best way in your situation – helping the boss out. You might have thought that this is a sure way to get promoted. But it doesn’t always work as automatically as that. And it didn’t in this case. They were overlooked. Mordecai was overlooked. But all this came to be very important in the story later on, as we will see. Someone once said that ‘No good turn goes unpunished.’ I don’t know if that’s true. I suppose we could describe what happened in the palace as some people plotting to stick the knife into their boss. Of course that often happens in the modern office, doesn’t it? ButChristians can, and I would argue, should, appear to lack something of that ruthless edge about them. They can appear not to have that ‘killer instinct’ that some people feel is absolutely essential in the modern workplace. But that’s because we actually love our enemies, and we try and do good to those who persecute us. Don’t we? Or doesn’t that apply when you go to work? No, it does apply when you go to work! I would argue that in the longer term, the behavior of Christians does tend to work out, actually. The Bible tells us that, “Those who live by the sword will die by the sword.” And, “Pride comes before destruction and a haughty spirit before a fall,” and that, “God opposes the proud but gives grace to the humble.” That “God exalts the lowly.” That ruthless person at your workplace may himself find that he is the victim one day. So it’s an interesting thing that actually in the long term, godly values work, even in the workplace. Godly values in the mid-to-long term work. Sometimes in the short to mid-term you can take a hit, if I’m honest. You can take a hit. For example in sales, it’s very easy to lie about your product to get this quarter’s sales better but especially in the media-age, if you sell a whole load of products this quarter to people who don’t really need it and your product is no good and they all start writing on Twitter about how rubbish it is, you won’t make your sales next quarter. Do you see what I’m saying? So in the short-term, for sure, dodgy ethics can sometimes beat godly ethics. There’s no question about that. But I would argue that in the mid to long-term, in almost every business, in almost every company, in almost every situation it just works. That’s not why we do it, mind you. I don’t think Mordecai thought, “I know, I’ll let the king know that he’s about to be killed because that way I’ll get promoted and become prime minister.” I don’t think he thought that way – he just did what he knew was right. The book of Esther : I am focussing on what this book can teach us about how we can respond to Jesus in our vocation, in our work and in all that God has called us to do. What we see in this book is a remarkable string of coincidences that at the time seem incredibly ordinary but were actually God working in the lives of these people. Nothing would have happened in this book if the king hadn’t got drunk one night at the beginning! It’s a ridiculous thought, isn’t it? And yet there’s this string of coincidences without which none of this would have happened. And what we see here is God using ordinary people, working together. It’s about how God can bring deliverance to His people; can bring salvation to His people; can bring remarkable affects to His people without actually them almost even knowing, at least initially, that that’s what’s happening. Remarkable things were happening. God was preparing His plans among a string of slightly strange experiences, but nonetheless not particularly dramatic. There was no writing in the sky, there was no ‘God spoke.’ Esther didn’t become Queen because God told her one day she was going to become Queen. Some Christians worry about not having heard from God. I do believe it’s right for us to pray, it’s right for us to seek God, it’s right for us to believe that God can speak to us today, butsometimes God will guide us in very ordinary, very normal ways. As I look back on my own career, I’ve had some remarkable direction from God. But I have to say, I’m not sure if ever God has ever really said, “Adrian, this is the way, walk in it,” in that sense. What has happened is, I’ve found my steps being led by God. And I’ve found opportunities arise that surprised me and astonished me really. But they were so-called coincidences that God used. In fact, there were various points in my career where I thought I knew where God was heading me along – what pathway he wanted me to go along. I was pretty sure, I had decided where I thought I would spend my career and spend my life. And yet, actually, a massive roadblock appeared in my face. And I butted my head against that roadblock and it didn’t move. And I butted my head again against the roadblock and it still didn’t move. And then I’m like “Now what do I do?” And so I just took whatever it was that presented itself before me. But the remarkable thing is that God then opened some other doors that led me to the job that I do now, which I’m very pleased to have. It’s a very helpful job for me in many, many ways. But you know, none of that would have happened if I hadn’t have had those roadblocks. So I think we have to realise sometimes that God guides us in a normal way. 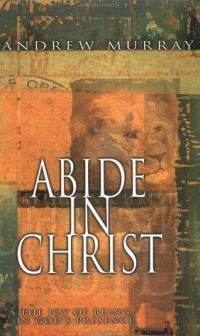 The following is the eighteenth chapter from Andrew Murray's book, Abide in Christ. There is a view of the Christian life that regards it as a sort of partnership, in which God and man have each to do their part. It admits that it is but little that man can do, and that little defiled with sin; still he must do his utmost—then only can he expect God to do His part. To those who think thus,it is extremely difficult to understand what Scripture means when it speaks of our being still and doing nothing, of our resting and waiting to see the salvation of God. It appears to them a perfect contradiction, when we speak of this quietness and ceasing from all effort as the secret of the highest activity of man and all his powers. And yet this is just what Scripture does teach. The explanation of the apparent mystery is to be found in this, that when God and man are spoken of as working together, there is nothing of the idea of a partnership between two partners who each contribute their share to a work. The relation is a very different one. The true idea is that of cooperation founded on subordination. As Jesus was entirely dependent on the Father for all His words and all His works, so the believer can do nothing of himself. What he can do of himself is altogether sinful. He must therefore cease entirely from his own doing, and wait for the working of God in him. As he ceases from self-effort, faith assures him that God does what He has undertaken, and works in him. And what God does is to renew, to sanctify, and waken all his energies to their highest power. So that just in proportion as he yields himself a truly passive instrument in the hand of God, will he be wielded of God as the active instrument of His almighty power. The soul in which the wondrous combination of perfect passivity with the highest activity is most completely realized, has the deepest experience of what the Christian life is. Among the lessons to be learnt of those who are studying the blessed art of abiding in Christ, there is none more needful and more profitable than this one of stillness of soul. In it alone can we cultivate that teachableness of spirit, to which the Lord will reveal His secrets—that meekness to which He shows His ways. It is the spirit exhibited so beautifully in all the three Marys: In her whose only answer to the most wonderful revelation ever made to human being was, "Behold the handmaid of the Lord; be it unto me according to Thy word"; and of whom, as mysteries multiplied around her, it is written: "Mary kept all these things and pondered them in her heart." And in her who "sat at Jesus' feet, and heard His word," and who showed, in the anointing Him for His burial, how she had entered more deeply into the mystery of His death than even the beloved disciple. And in her, too, who sought her Lord in the house of the Pharisee, with tears that spake more than words. It is a soul silent unto God that is the best preparation for knowing Jesus, and for holding fast the blessings He bestows. It is when the soul is hushed in silent awe and worship before the Holy Presence that reveals itself within, that the still small voice of the blessed Spirit will be heard. Therefore, beloved Christian, as often as you seek to understand better the blessed mystery of abiding in Christ, let this be your first thought (Ps.62:5, marg. ): "My soul, only be silent unto God; for my expectation is from Him." Do you in very deed hope to realize the wondrous union with the Heavenly Vine? Know that flesh and blood cannot reveal it unto you, but only the Father in heaven. "Cease from thine own wisdom." You have but to bow in the confession of your own ignorance and impotence; the Father will delight to give you the teaching of the Holy Spirit. If but your ear be open, and your thoughts brought into subjection, and your heart prepared in silence to wait upon God, and to hear what He speaks, He will reveal to you His secrets. And one of the first secrets will be the deeper insight into the truth, that as you sink low before Him in nothingness and helplessness, in a silence and a stillness of soul that seeks to catch the faintest whisper of His love, teachings will come to you which you had never heard before for the rush and noise of your own thoughts and efforts. You shall learn how your great work is to listen, and hear, and believe what He promises; to watch and wait and see what He does; and then, in faith, and worship, and obedience, to yield yourself to His working who works in you mightily. One would think that no message could be more beautiful or welcome than this, that we may rest and be quiet, and that our God will work for us and in us. And yet how far this is from being the case! And how slow many are to learn that quietness is blessedness, that quietness is strength, that quietness is the source of the highest activity—the secret of all true abiding in Christ! Let us try to learn it, and to watch against whatever interferes with it. The dangers that threaten the soul's rest are not a few. There is the dissipation of soul which comes from entering needlessly and too deeply into the interests of this world. Every one of us has his divine calling; and within the circle pointed out by God Himself, interest in our work and its surroundings is a duty. But even here the Christian needs to exercise watchfulness and sobriety. And still more do we need a holy temperance in regard to things not absolutely imposed upon us by God. If abiding in Christ really be our first aim, let us beware of all needless excitement. No less hurtful is the spirit of fear and distrust in spiritual things; with its apprehensions and its efforts, it never comes really to hear what God has to say. Above all, there is the unrest that comes of seeking in our own way and in our own strength the spiritual blessing which comes alone from above. The heart occupied with its own plans and efforts for doing God's will, and securing the blessing of abiding in Jesus, must fail continually. God's work is hindered by our interference. He can do His work perfectly only when the soul ceases from its work. He will do His work mightily in the soul that honours Him by expecting Him to work both to will and to do. And, last of all, even when the soul seeks truly to enter the way of faith, there is the impatience of the flesh, which forms its judgment of the life and progress of the soul not after the divine but the human standard. In dealing with all this, and so much more, blessed the man who learns the lesson of stillness, and fully accepts God's word: "In quietness and confidence shall be your strength." Each time he listens to the word of the Father, or asks the Father to listen to his words, he dares not begin his Bible reading or prayer without first pausing and waiting, until the soul be hushed in the presence of the Eternal Majesty. Under a sense of the divine nearness, the soul, feeling how self is always ready to assert itself, and intrude even into the holiest of all with its thoughts and efforts, yields itself in a quiet act of self-surrender to the teaching and working of the divine Spirit. It is still and waits in holy silence, until all is calm and ready to receive the revelation of the divine will and presence. Its reading and prayer then indeed become a waiting on God with ear and heart opened and purged to receive fully only what He says. "Abide in Christ!" Let no one think that he can do this if he has not daily his quiet time, his seasons of meditation and waiting on God. In these a habit of soul must be cultivated, in which the believer goes out into the world and its distractions, the peace of God, that passeth all understanding, keeping the heart and mind. It is in such a calm and restful soul that the life of faith can strike deep root, that the Holy Spirit can give His blessed teaching, that the Holy Father can accomplish His glorious work. May each one of us learn every day to say, "Truly my soul is silent unto God." And may every feeling of the difficulty of attaining this only lead us simply to look and trust to Him whose presence makes even the storm a calm. Cultivate the quietness as a means to the abiding in Christ; expect the ever deepening quietness and calm of heaven in the soul as the fruit of abiding in Him.